Shar Pei Dogs - The Shar Pei, also known as the Chinese Shar Pei, is a compact medium sized dog in the non-sporting group that originates from the Guangdong province of China, where it was well-known as a fighting and guard. The Shar Pei has distinctive features of deep wrinkles and a blue-black tongue. As puppies, Shar Pei have lots of wrinkles, but as they mature, the wrinkles disappear as they "grow into their skin". Small ears, a muzzle shaped like that of a hippopotamus, and a high set tail also give the Shar Pei a unique look. The Shar Pei is known for being an independent, intelligent, and snobbish breed. Nevertheless, the Shar Pei are extremely devoted, loyal and loving to their family. They are often reserved with strangers, which strengthens their guard dog skills. The Shar Pei is easy to train but gets bored from repetition. Overall, the Shar Pei is a dog that is loyal and loving to their family while being independent. This information is licensed under the GNU Free Documentation License. It uses material from the Shar Pei article on Wikipedia.org. 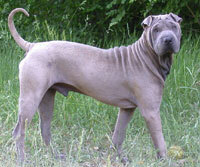 Shar Pei Dog Breeders - Advertise your kennel puppies and dogs here.